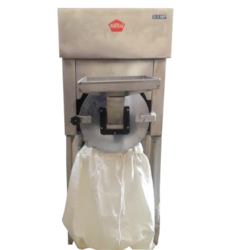 Offering you a complete choice of products which include heavy duty flour mill 3 hp (ss), heavy duty flour mill 2 hp and heavy duty flour mill 5 hp (ss). 3HP MODELS Electric Moter-Single/ Three Phase, 230 V AC Size-410mm x 560mm x 8010mm (LxBxH)Weight-75 kg. (approx. )Hopper Capacity-15 kg. 2. Castor wheels /rubber base. 3. Smaller floor space 2sq.ft. 4. Heavy Duty powerful electric NATRAJ SILICON TECHNOLOGY COPPER WINDING Motor For Continues Grinding. · Get 100% fresh and pure whole grain flour with all proteins, vitamins fibers intact. · Grinds everything right from wheat, rice to jowar, bajra, maize and also masalas like Red Chilly, Turmeric, black pepper etc. Hopper Capacity - 20 kg.